Make a thin batter with gram flour(besan), food colour and water & keep it in a consistency not to dilute too much. Hold a wholed spoon on top of hot oil & spoon in the better slowly so that it drips into tiny droplets & get fried evenly until golden brown.this is called boondi. Drain the boondhi in a parchment paper to remove all extra oil. In the meanwhile make sugar syrup with water & sugar until you get a consistancy of 1 string. Add in the boondhi to the sugar syrup & mix well. Allow it to cool which inturn soaks the boondhi in sugar & gets soft. With little butter in hand when the mixture is warm make equal balls & leave it to rest. Serve cold & happy Diwali. Happy Diwali. 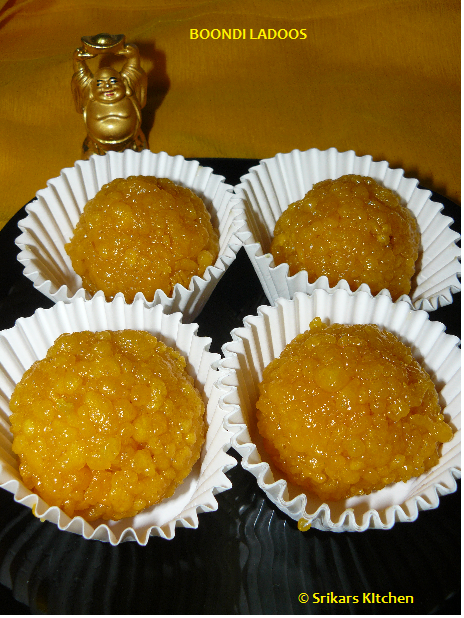 Boondi laddu looks delicious:). awesome laddos! Happy Diwali to you and your family! wow my dadi used to made this,..happy diwali,.. Happy Deepavali! 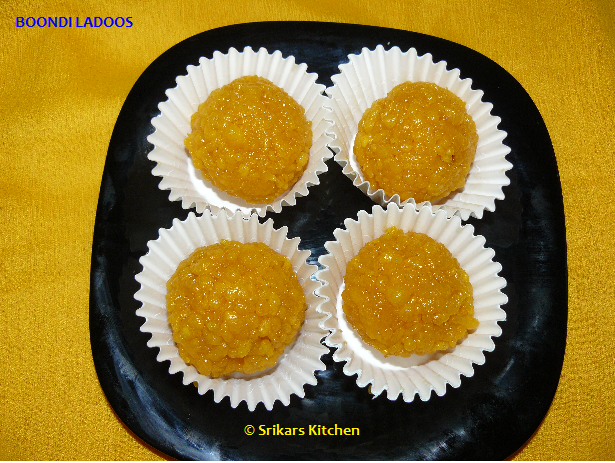 Love boondi laddu but have never dared to make them myself! Sri, same pinch..i too prepared boondi laddoo, prefect sweets for diwali..Wishing you a happy diwali to u and ur family dear.. Happy Deepavali to you and your family too! Boondi laddo looks good! Prefect sweet for Diwali. Looks so good. Turned out so good for u. YUM! This is my favourite indian sweet.YUmmy. Yummy ladoos.. Hope you had a wonderful celebration! The ladoos look perfect - first time on your blog - you have a really nice space!